This country’s workers, union and Government officials today paid tribute to National Hero and labour icon Sir Frank Walcott at the annual May Day parade. The parade took off from the Garrison, and workers walked through Dalkeith, then onto Culloden Road. At Culloden Road, Labour Minister Dr Esther Byer-Suckoo, former Barbados Workers Union General Secretary Sir Roy Trotman and his successor Toni Moore were among those who laid wreaths at the Sir Frank Walcott monument. 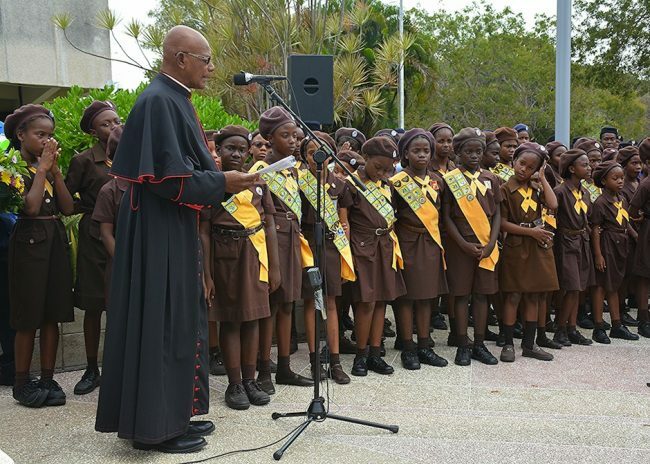 During the brief ceremony, Anglican cleric Reverend Dr Frank Marshall prayed for the rebuilding of the Social Partnership among Government, the private sector and trade unions to ensure a friendly industrial climate in Barbados. The parade then continued into Bridgetown. Workers were due to make their way through Bay Street to Brownes Beach where the BWU head and Prime Minister Freundel Stuart will address the gathering.